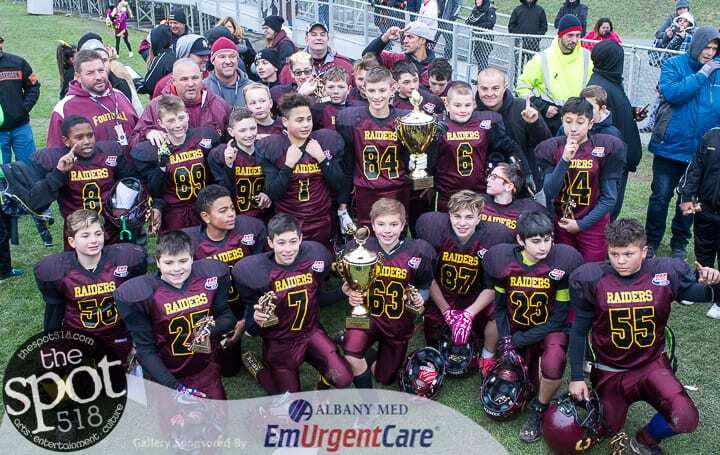 ALBANY – For the first time in 14 years, the Colonie Pop Warner team won the Super Bowl. After a hard-fought, well-played game against the squad from Green County on Saturday, Nov. 18, The Raiders walked out of Bleeker Stadium with a 16-7 victory. For Colonie, Michael DonVito caught a touchdown pass from quarterback PJ Parisi, and Luke Szepek recovered a fumble for the second score. Both two-point conversions were successful. Check out print edition for a complete write up of the game and more about Colonie Pop Warner.